1. Amanita ristichii, Maine, U.S.A.
Amanita ristichii is a small, mostly white mushroom; its stem is annulate and has a sheathing, membranous volva at its base; usually its gills are strikingly orange-white or pink; its cap has relatively short marginal striations. It is one of the small, North American group within section Caesareae that have plentiful two-spored basidia, although, within that group, it is isolated by its unpigmented cap, sometimes pinkish gills, short marginal striations on the cap, and the more robust volva at the stipe base. cap The white cap of this species is 25 - 64 mm wide; it is hemispheric or broadly rounded-conic before expansion and sometimes has a slight umbo. Its surface is dull to slightly shiny and subviscid. Its flesh is whitish. Its margin is short striate at first, but may striations may take up about two-thirds of the cap radius in mature material. There are no volval remnants on the cap. gills The gills are free or narrowly attached to the stem, pale pinkish or orangish white or whitish; and short gills are plentiful and sharply cut off on the free end. stem The stem of this species is 37 - 89 × 3 - 11 mm, white to whitish or a very pale version of the gill color (when that is not whitish). A small white ring appears on the stem above the middle, but this may be lost with time or become flattened on to the stem. The volva takes the form of a persistent, membranous, white sack at the stem's base. odor/taste The odor is weak, and the taste has not been reported. 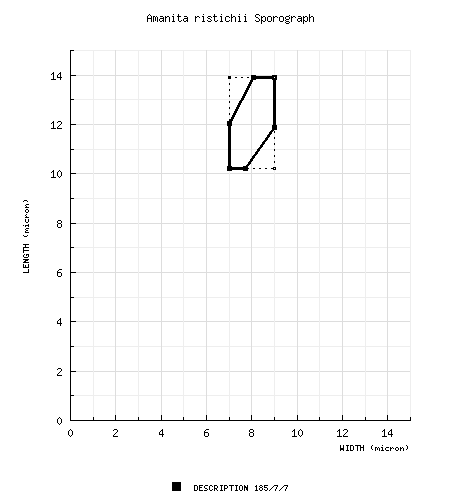 The spores measure (9.2-) 10.2 - 13.9 (-17.0) × (6.6-) 7.0 - 9.0 (-12.8) µm and are ellipsoid to elongate (infrequently broadly ellipsoid) and inamyloid. Clamps are frequent at the bases of basidia. Amanita ristichii is known only from southeastern Canada and from New Hampshire and Maine (from which it was originally described) in the U.S.A. It fruits in July and August. The species was named for Dr. Samuel S. Ristich. It is noteworthy that some basidiomes of the Canadian material are larger than any found in the U.S. It is associated with Canadian Hemlock, White Pine, Aspen, and fir. author Tulloss. 1989. Mycotaxon 35: 363, figs. 1-3.
etymology genitive of Latinized name; hence, "of Ristich" or "Ristich's". Named in honor of Dr. Samuel S. Ristich. The following is based on the protolog of the present species and other original research of R. E. Tulloss. Since the personal methodology that was assembled during the period 1991-1995 was not known to me in 1989, there are a number of gaps in the following data that need to be filled. pileus 25 - 64 mm wide, hemispheric or broadly rounded-conic at first, becoming convex then planoconvex, sometimes with slight umbo, white, surface dull to slightly shiny, subviscid; context whitish, 3± mm thick over stipe; margin striate (0.2 - 0.3R at first, but up to 0.65R in mature material), nonappendiculate; universal veil absent. lamellae free to narrowly adnate, close, pinkish or (occasionally) whitish in mass, drying pinkish to pale orange (5A3 or 5YR 8/4) or pale salmon pink (Lamoureux 1885), about 3 - 6 mm broad, with concolorous and minutely flocculose edge, occasionally anastomosing; lamellulae truncate to subtruncate, plentiful. stipe 37 - 89 × 3 - 11 mm, white to whitish or occasionally palely concolorous with the lamellae (Lamoureux 1885), narrowing upwards to cylindric, browning from handling, longitudinally striatulatee, pulverulent above annulus, somewhat fibrillose below; context whitish, hollow with some cottony stuffing in 1 - 2 mm wide central cylinder; partial veil superior to subsuperior, white, delicate, finely striate above, sometimes disappearing or, if not, becoming appressed to stipe and browning at margin in age; universal veil membranous, persistent, saccate, breaking into several, sometimes pointed limbs about 1 mm thick, white to whitish, flaring in upper one-half to two-thirds or collapsed against stipe, with tallest limb reaching 12 - 25 mm from stipe base, with limbus internus positioned in upper third of interior surface of limb. odor/taste Odor weak (Lamoureux 1885). Taste not recorded. pileipellis 50 - 60 µm thick; penetrated in lower portion by upturned tips of hyphae (filamentous or inflated) from pileus trama; filamentous, undifferentiated hyphae ? µm wide, ? ; vascular hyphae occasional, sometimes in fascicles, randomly to subradially arranged, interweaving, gelatinizing throughout, but especially strongly in upper 10 µm. pileus context filamentous, undifferentiated hyphae 1- - 10.8 µm wide, tangled, interwoven, branching, with slightly inflated segments to 19.6 µm wide; acrophysalides elongate-clavate to bacilliform, to 135 × 45.5 µm, elongate clavate to bacilliform, somewhat difficult to reinflate; vascular hyphae 1.7 - 4.5 µm wide, occasional. lamella trama bilateral; wcs = ? µm; filamentous, undifferentiated hyphae 1.5 - 5.6 µm wide, branching, with somewhat inflated segments up to 14.7 µm wide; inflated cells up to 115 × 26 µm, in chains; vascular hyphae 2.5 - 13.3 µm wide, branching; clamps occasional, conspicuous. subhymenium wst-near = μm; wst-far = μm; comprising small cellular subglobose to pyriform elements in short chains clustered at end of broadest diameter hyphae (with latter arising in central stratum). basidia 42 - 60 × 8.5 - 12.5 µm, clavate to narrowly clavate, about half to two-thirds 2-spored, also 1-, 3-, and 4-spored, several aborted or stunted (measurements of such not included in dimensions cited), thin-walled, apparently rapidly collapsing after release of spores, with some basidioles branching, with sterigmata up to 3.5 µm long; clamps frequent. universal veil with tissues densest on inner and outer surfaces, else rather uniform in cross-sectional mount; in some specimens, all tissues somewhat difficult to reinflate except vascular hyphae; vascular hyphae throughout 4.9 - 7.7 µm wide. On pileus: absent. On stipe base, exterior surface: filamentous, undifferentiated hyphae 1.7 - 5.6 µm wide, branching, interwoven to sublongitudinally arranged, gelatinizing; vascular hyphae ? µm wide, ?. On stipe base, interior: filamentous, undifferentiated hyphae ? µm wide, ?, dominating, sublongitudinally oriented; inflated cells terminal, broadly ellipsoid to cylindrical, up to 77 × 63 µm; vascular hyphae ? µm wide, ?. On stipe base, inner surface: filamentous, undifferentiated hyphae to 14 µm wide in a rather easily separable layer, less than five hyphal diameters thick, longitudinally oriented, somewhat gelatinizing; inflated cells not observed; vascular hyphae ? µm wide, ?. stipe context longitudinally acrophysalidic; filamentous, undifferentiated hyphae, 1.0 - 4.2 µm wide, branching; acrophysalides narrowly elongate, up to 400 × 42 µm; vascular hyphae 3.5 - 8.4 µm wide. partial veil filamentous, undifferentiated hyphae 1.4 - 7.7 µm wide, partially gelatinizing and difficult to reinflate, branching, dominating; inflated cells difficult to reinflate, apparently subglobose to broadly ellipsoid to ovoid to elongate to clavate, up to 81 × 49 µm; vascular hyphae 2.1 - 5.9 µm wide, branching, densely tangled locally. Note: Due lack of knowledge in 1989, Tulloss may have included lamella edge cells as inflated cells of the partial veil. This would explain the large size attributed to the largest cell observed. composite of data from all material revised by RET: [185/7/7] (9.2-) 10.2 - 13.9 (-17.0) × (6.6-) 7.0 - 9.0 (-12.8) µm, (L = 11.5 - 12.4 µm; L’ = 12.1 µm; W = 7.7 - 8.5 µm; W’ = 8.0 µm; Q = (1.22-) 1.32 - 1.72 (-1.84); Q = 1.42 - 1.57; Q’ = 1.50), inamyloid, thin-walled, hyaline, broadly ellipsoid to ellipsoid to elongate, occasionally expanded at or near one end; apiculus sublateral, cylindric, 1 µm wide; contents guttulate; white in deposit. ecology Described from southern Maine and southern New Hampshire, but possibly more common to the north in Canada. Solitary to subgregarious, in sandy soil. Maine: Under Tsuga canadensis and Acer rubrum in flood plain of river or under T. canadensis and Pinus strobus as dominant trees in mixed forest. New Hampshire: Under Pinus sp. (Krieger Kr. 224) or under Picea abies in plantation of P. strobus (Miller 339). Québec, Canada: Under Populus tremuloides (Lamoureux 1885) (at this site repeated fruitings observed throughout summer). material examined CANADA: QUÉBEC—Région Laurentides - Mirabel, 4.vii.1993 Pierre Ray & Louise Bushey s.n. [Yves Lamoureux 1885] (CMMTL; RET 096-1). U.S.A.: MAINE—Androscoggin Co. - Sabbatus, 23.vii.1984 S. S. Ristich s.n. [Tulloss 7-23-84-SSRA] (paratype, RET 045-1). Cumberland Co. - Windham, flood plain of Pleasant River, 11.vii.1984 S. S. Ristich s.n. [Tulloss 7-11-84-SSR1] (paratype, RET 007-2), 13.vii.1988 S. S. Ristich s.n. [Tulloss 7-13-88-SSRA] (paratype, RET 124-10), 13.vii.1988 S. S. Ristich s.n. [Tulloss 7-13-88-SSRB] (paratype, RET 124-9), 30.vii.1988 S. S. Ristich s.n. [Tulloss 7-30-88-SSR1] (paratype, RET 045-3). Oxford Co. - Oxford, 15.vii.1985 T. Herman s.n. [Tulloss 7-15-85-SSR1] (holotype, NY 00066698). NEW HAMPSHIRE—Carroll Co. - Chocorua, 28.vii.1906 L. C. C. Krieger Kr. 224 (paratype, FH). Hillsborough Co. - Fox St. For., 28.viii.1959 O. K. Miller 339 (MICH). discussion Amanita ristichii is a small, mostly white mushroom; its stipe is annulate and has a sheathing, membranous volva at its base; often its lamellae appear strikingly orange-white or pink; its pileus has relatively short marginal striations. It is one of the small group within section Caesareae that have mostly bisterigmate basidia (all members of the stirpes Pachysperma and Ristichii). Amanita ristichii is the sole species assigned to stirps Ristichii. C. Bas has observed (pers. comm.) that the presence of some bisterigmate basidia is not uncommon in many taxa of Amanita In a number of taxa, it is rather common to find such basidia in specimens in which sporulation is just beginning. The previously described North American species with plentiful bisterigmate basidia at maturity are apparently rarely [knowingly] collected according to Jenkins (1986). Except for very localized plenitude at one New Jersey site of A. virginiana and one or more reported Illinois sites of the same species (Began 1988), I’ve no evidence to the contrary. Described from sandy ground in woods, Watauga County, North Carolina, A. pachysperma is similar to A. ristichii in size of basidiome, presence of an annulus and membranous volva, and in spore shape. It is described as being the color of Amanita cinerea Bres. (≡A. bresadolana) ["livido-grigiastro traente al cenerino" (Bresadola, 1881: 75)]; and it has proportionately longer marginal striations on its pileus. It differs markedly from A. ristichii in microscopic characters. For example, the acrophysalides of the stipe tissue of A. pachysperma are half the length of those of A. ristichii; also, the former has spores that are, on average, shorter and narrower than those of the present species. Amanita virginiana has a grayish brown pileus that is darker brown over the disc and marginal striations proportionately longer than those of A. ristichii; its spores, basidia, and stipe acrophysalides are all of dimensions differing from those of A. ristichii. By similar reasoning, the possibility that the holotype of A. ristichii could be assigned to A. subvirginiana can also be rejected. Krieger preserved Kr. 224 as a voucher from which he had painted an excellent watercolor (also in FH) showing Kr. 224 whole and in longitudinal section. The specimen is in poor condition, but large spores and acrophysalidic stipe context are to be seen. The watercolor leaves little doubt as to the identity of the collection; it represents very clearly all major macroscopic characters except the presence of an internal limb in the volva. The specimen is accompanied by three pages of discursive description by Krieger and a note in the handwriting of W. D. Farlow which summarizes some of Krieger’s description and adds notes on the spores including the observation that "some spores were monstrous, as large as 6 div. × 4 1/2 div." Krieger’s notes are the source of my information about the anastomosing of lamellae and striation of the upper surface of the annulus. He also mentions previously having collected the entity in 1904 in Chocorua; however, I have not located any 1904 collection. Because the few spores I found in Kr. 224 were on the stipe and, in some cases, were damaged, I have not included their measurements in the data on basidiospores, above. The eight spores measured fell into the following range: 12.0 - 15.0 × 6.5 - 9.4 µm. In the field, A. ristichii might be confused with A. vaginata var. alba sensu auct. amer. as described in North American field guides and floristic studies (e.g., see Miller & Farr (1975). 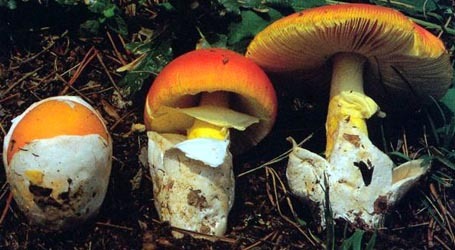 Amanita ristichii can be distinguished by many characters including the size and shape of its spores, the more robust universal veil, orange-white or pinkish gills drying a similar color, an annulate stipe, and bisterigmate basidia. photo Dr. Samuel S. Ristich - (1) Maine, U.S.A.
select a collection to review/add spore measurements..#785652. Pierre Ray & Louise Bushey, #s.n.=>Yves Lamoureux 1885, CANADA, QUÉBEC..#785653. S. S. Ristich, #s.n.=>Tulloss 7-23-84-SSRA, U.S.A., MAINE, Androscoggin..#785654. S. S. Ristich, #s.n.=>Tulloss 7-11-84-SSR1, U.S.A., MAINE, Cumberland C..#785655. S. S. Ristich, #s.n.=>Tulloss 7-13-88-SSRA, U.S.A., MAINE, Cumberland C..#785656. S. S. Ristich, #s.n.=>Tulloss 7-13-88-SSRB, U.S.A., MAINE, Cumberland C..#785657. S. S. Ristich, #s.n.=>Tulloss 7-30-88-SSR1, U.S.A., MAINE, Cumberland C..#785658. T. Herman, #s.n.=>Tulloss 7-15-85-SSR1, U.S.A., MAINE, Oxford Co., Oxfo..#785659. L. C. C. Krieger Kr., #224, U.S.A., NEW HAMPSHIRE, Carroll Co., Chocoru..#785660. O. K. Miller, #339, U.S.A., NEW HAMPSHIRE, Hillsborough Co., Fox State ..